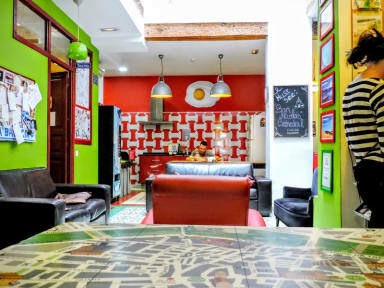 Home Youth Hostel Valencia by Feetup Hostels i Valencia, Spanien : Boka nu! Home Youth Hostel is a cosy hostel full of character! You will enjoy a unique and unforgettable experience with us. Our staff will always do everything for you to feel part of the family and not just a tourist. You can enjoy our free dinner and sangría night. Our slogan is: Don’t be a tourist be a traveller! Located in the heart of the city, in Barrio del Carmen, it´s next to the Central Market and La Lonja (Silk Market), two of the most important tourist attractions in Valencia. We offer 3 and 4 bed dormitories and private rooms. Moreover, is the only Hostel in Valencia without bunkbeds! It´s art-deco decoration, different in each room, makes it unique in the city! It´s perfect for travelers looking for a clean, comfortable place full of color. This place has it all. Friendly, helpful staff, clean rooms and reception area, good wifi, GREAT location, good security, free walking tours, safe female dorms. It was a huge factor in making Valencia one of the favourite cities I've visited. I'll definitely be back next year for another stay. This is such a great hostel! The location is awesome, close to nice restaurants and bars. The staff is superfriendly and gave me great advice about the city. Every night, they cooked a delicious free family dinner!! And just sitting in the lobby you'll meet and talk to a lot of people. It's easy to be social there. Really recommend it!! Great location, beds ok, not sound proof at all, mixed feelings from the staff, very non-private toilets. building is very bad constructed so everything can be heard very easily. We were out much and rarely spent time in the hostel so it was ok but this was miles away from the super hostel we were at in Malaga. Expensive laundry and printing. If not for the 2 cool staff girls, it would have been worse. They also lost some of our clothing in the laundry. But it was decent with good location.